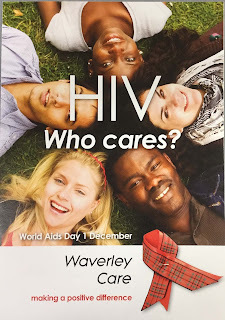 For the last two weeks, I have been working on cataloguing and repackaging the papers of Waverley Care Trust, an Edinburgh-based organisation set up in 1989 to provide support to those affected by HIV and AIDS. Their remit later broadened to include work with individuals diagnosed with Hepatitis C, while their geographical reach has expanded beyond the Lothians to cover the whole of Scotland. Regular blog readers might remember the post from earlier this year introducing Waverley Care and its key services, and showcasing a selection of collection items. Besides key administrative records like business plans and annual reports, the collection includes a great deal of visual and ephemeral material that adds additional detail to the picture of the charity’s day-to-day work. Items like flyers and invitations, for example, provide a tangible connection to events recorded officially elsewhere; they suggest particular moments or interactions. Posters and postcards demonstrate the outward-facing work of Waverley Care: raising awareness, contributing to the public understanding of HIV and developing links to the larger community. Invitation to ‘Pride & Prejudice’ exhibition (1999). GD36/4/1/7. Taken together, all of the records within this collection document the extraordinary range of services, initiatives and activities facilitated by staff and volunteers. While working my way through the material, I found references to tai chi, sculpture, quilting, mask-making, line dancing, poetry writing, walking, reflexology, papermaking, video editing, singing and stained glass design (a non-comprehensive list!). Many of these activities were run as part of the Arts Project, an ambitious programme which began in the early nineties, administered jointly through the SOLAS Centre and Milestone House. The Waverley Care collection includes snapshots and samples of some of the end-products of this project - two printed booklets of participants’ writing, posters for public exhibitions of artwork, photographs of a completed stained glass window in situ at Milestone House - but also goes some way towards recording the equally (or more) valuable process of creation. Papermaking workshop in progress, and completed sheets of handmade paper (1996). GD36/3/3/2/4/22. Looking at the changing types of services offered by Waverley Care over the 1990s and 2000s reveals the organisation’s responsiveness to both the needs expressed by their users and to developments in HIV treatment and care. From its establishment, the Information Centre at SOLAS allowed users to carry out their own research into treatment options, a particularly important function in the years before widespread internet access. Waverley Care’s annual review for 1995 notes excitedly that ‘the Information Centre is about to join the Worldwide Internet’ (capitals original! ), while the report for 1997 contains the news that they are ‘looking forward to the installation of a second Internet terminal’, possibly reflecting increased demand for up-to-date information about drug treatments in the early years of combination therapy. Information leaflet for World Aids Day. GD36/4/1/4. Having examined and described each of the records within the Waverley Care Trust collection, I was left with a clear sense of the organisational ethos and of the ways in which staff, volunteers, service users, families, carers and others involved with the work of the charity were able to form a network of mutual support. They tell of imagination and encouragement, of enthusiasm and vitality. Equally, these records tell only partial stories, and there will have been many encounters and experiences on which they are silent - narratives that rely on the memories of those with a personal connection to the charity and its work. Cataloguing, though, represents a step towards initiating these potential conversations and towards putting the Waverley Care records into dialogue with items from LHSA’s related collections, which will in turn allow further aspects of the collective response to HIV and AIDS in Edinburgh and the Lothians to be brought to light.